When Apple changed its name from Apple Computer to Apple Inc. they signaled that their business has moved on. 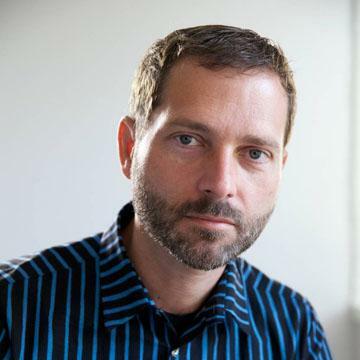 We can say it’s to devices or to mobile computing or to the Post-PC era. To understand that this is not a shift driven only by wishful thinking we can plot the change in volumes for the platform-based devices Apple sells. The stack of products is shown in an increasing level of mobility. At the bottom is the non-portable desktop Mac, above are Mac portables (laptops) followed by the iPad, iPhone and iPod touch. 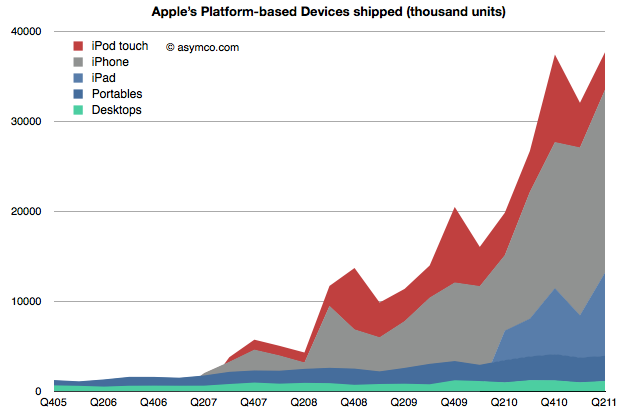 The mobile computers Apple sells are explosively more popular (and important). To gauge importance consider the following chart which shows the unit values above multiplied by the average price they are able to obtain for a picture of the sales mix. (I also added Peripherals, Music and Software sales as well as iPod (non-touch) for a complete split of revenues). 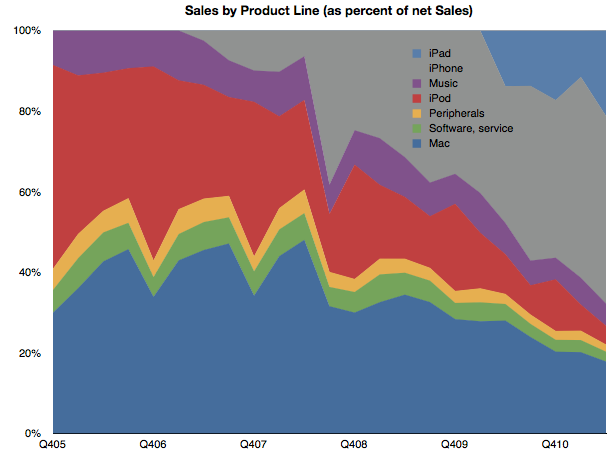 Mobile computers are now well above half the revenue base for Apple. Finally, if we consider the contribution to profitability of each product line, we can see how iOS-enabled products (as a proxy for mobile computing) have become the vast bulk of profit creation for Apple. By this metric, we can see that mobile computing (as opposed to portable or immobile computing) is driving 80% of Apple’s profitability. This 80/20 mix of mobile/non-mobile should put aside any doubts that Apple has moved on to be a business oriented around mobility rather than traditional computing. This cannot be said for many of Apple’s contemporaries. Microsoft derives negligible revenues from mobility. Neither does Intel, nor Dell or HP and even Google’s revenue lines don’t make mention of mobile income. In fact, the only companies which do have mobile revenues as 80% of their income are those dedicated to telecom markets. Namely, Nokia, Motorola, Sony Ericsson, RIM et. al. 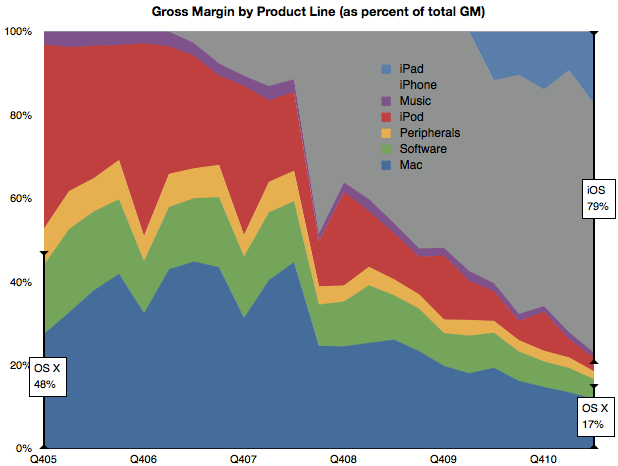 But, as we shall see in the quarterly mobile market overview, few of Apple’s mobile-focused competitors are doing well. So Apple is a unique company that has made the transition from one industry to another and, in so doing, captured the bulk of the profits. In passing, I should also mention that the traditional Mac business is still doing well and, by some measures, is capturing the bulk of the PC hardware profits. So the key to much of assessing Apple’s value and opportunity should be based on this new market (mobile computing) rather than the traditional competitive landscape of PCs and operating systems. The company has moved on, now we wait to see how long before analysis of the company follows.